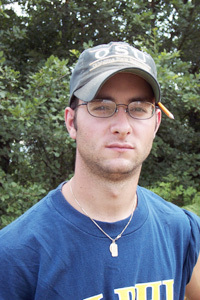 Field Supervisor of Trenches PF 6 and 9, Robert "Base" Belanger. Trench PF 9 represents the latest in a series of MVAP excavations in the Podere Funghi, a lightly sloping hill approximately 500 meters southeast of the main hilltop arx of Poggio Colla. The initial decision to excavate this now fallow field (a former cornfield still affectionately referred to as the "Field of Dreams," or "FOD" for short) in the Colle al Bosco was determined in the Spring of 1998 during a field-walking survey done after mechanical deep plowing of the area revealed several zones of high ceramics concentration. 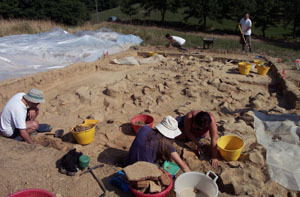 During the excavation of Trench PF 1 that year, an impressive array of domestic Etruscan ceramic wares were discovered in a presumed midden site in the western center of the field, prompting further expansion northward with 1999's Trench PF 2. 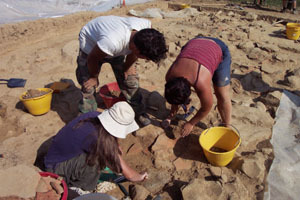 After two seasons in this area, and with subsequent test trenches PF 3 and 4 in the center of the field reaching bedrock, the decision was reached in 2000 to excavate a particular zone of high tile concentration 50+ meters away on the northeast crest of the hill in the hopes of discovering the remnants of an Etruscan structure. 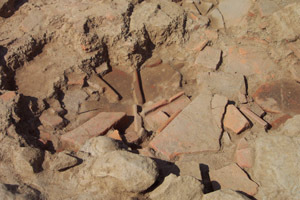 The results were highly rewarding--Trench PF 5 conclusively certified Etruscan habitation of the Podere Funghi with its three intersecting foundation walls, circular hearth, and varied metal, ceramic, and bone finds. Considering the location of the hearth in the northeast profile and the abutting walls protruding into the northeast and southwest profiles, in 2001 two trenches were mapped out in the Podere Funghi--Trench PF 6 concentrated on the 5 x 5 meter grid square to the north, while Trench PF 7 occupied the 5 x 5 meter grid square to the west. The results of last season were quite intriguing. Trench PF 6 established the continuance of the two northeasterly running foundation walls, a large tile fall within a thick pocket of burned carbon (most likely the decayed roof timbers of the structure), and a quarter of a kiln footprint in the immediate northwest corner; while Trench PF 7 unearthed a complete footprint for an updraft kiln, two terminal corners of the foundation walls, and a final kiln footprint straddled by the northeasterly-running foundation wall between Trenches PF 5 and 7. Additional GPR (Ground Penetrating Radar) surveys undertaken midway through the 2001 season led to the excavation of the exploratory Trench PF 8 on an intriguing elevated plateau in the immediate southeast corner of the field, which exposed a northeasterly-running, stone covered deep modern (1930s) drainage ditch. After reviewing the data of the past four years, it has been determined that the goal of the next few seasons will be to complete the excavation of the Etruscan structure at the northern end of the field, rather than expand into other areas. As of this time, GPR, field-walking, and resistivity surveys have been inconclusive as to Etruscan habitation in areas other than the presumed midden and structure; and publication of the aforementioned areas has been deemed a high priority. As such, work will center on working outward from the area of the structure already previously excavated during the 2002 season, via 5 x 5 meter grid squares to the north, west, and east of Trench PF 6 (as the area south of Trenches PF 5 & 7 is seemingly sterile), with Trench PF 9 denoting the 5 x 5 meter area immediately north of Trench PF 6. 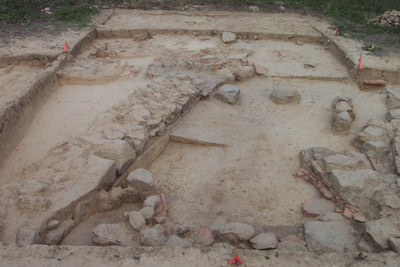 The aim of this trench is to further define the context of the kilns, isolate the dimensions of the tile fall, and determine the extent of the northeasterly running foundation walls, in the hopes of ultimately fully defining the dimensions, form and function of the Etruscan structure(s) situated on the northern crest of the Podere Funghi. The past week has been quite productive, incorporating a number of unexpected changes which have profoundly impacted both the excavation of the trench and the crew responsible for doing so. Initially the excavation plan of Trench PF 9 called for a standardized stratigraphic peel of all strata, beginning in Loci 3 and 4 and then progressing into Loci 1 and 2 once the surface level was down to the approximate depth reached in Trench PF 6 last year. This plan was significantly altered early this week with the decision to reopen Trench PF 6, a decision made with the purpose of excavating out the tile fall and documenting the layers underneath it to better understand the form, function, and dimensions of the structure on the northern hillcrest of the Podere Funghi. View of Trenches PF 6 and 9 during Week 4. This shift in excavation planning, combined with the completion of Trench PF 11 and subsequent reassignment of staff members to oversee a new trench on the main arx of Poggio Colla, has affected the dispersal of available personnel between both trenches. Meg Common has regrettably been reassigned to Trench PC 24 until further notice, and I have been given two additional excavators, Rebecca Lanthorne and Joe Cosentino, to join my current crew to excavate Trench PF 6 for these next few weeks. I am excited to have these two excavators on board for the remainder of the season, but losing a crewmember familiar with both the stratigraphy and excavation methodology of the area to another trench in the process was a truly unfortunate occurrence. 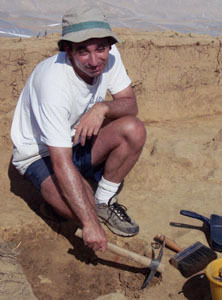 Left: Joe Cosentino working in Trench PF 9. 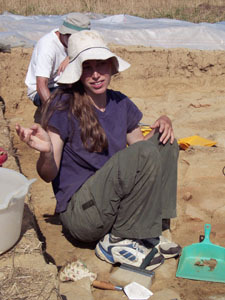 Right: Rebecca Lanthorne digging in PF 6. With these new changes in manpower, the remainder of the second pass through Stratum 2A in Loci 3 and 4 of Trench PF 9 was expediently and efficiently removed by Rebecca, Ivo, and Jen by midweek, exposing the entire area at the level of the kiln footprints and the tile fall. Now that this area has been completely exposed to the same level throughout both loci, it offers a particularly interesting look into the relationship of the features to each other within the context of the same level stratigraphic level. Certainly, another pass through the stratum should do much to better understand the relationship of both the kilns and the tile fall within the context of the structure as a whole, but it must be postponed for the time being. This pass will not come for another week at the minimum, as the top priority has now been placed on working through the lower levels in Trench PF 6, to explore the extent of the tile fall in the interior of the structure and hopefully ascertain the depth of the occupation level in the process. This in itself is quite a task, for the tile fall feature exposed last season at the Stratum 2A level (Please see Trench PF 6 2001 Final Excavation Report) was quite expansive in its breadth and included numerous diagnostic tile sections. Thus, as of the completion of this past pass, the excavation in Unit PF 9 was halted to dedicate all crewmembers to the continued excavation of Trench PF 6, the 5 x 5 meter grid square directly south of Trench PF 9. 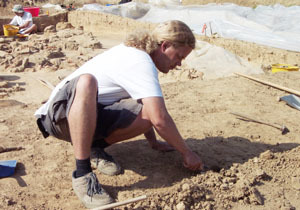 Ivo van der Graaff excavating in Trench PF 9. Jenny Muslin digging in Trench PF 6. This was begun while the above pass was still being completed early last week, with Joe and I removing backfill from Trench PF 6 with additional assistance from Administrative Intern Susan McIntyre, who volunteered to excavate with us for the week. After completing the pass in Trench PF 9, the others quickly joined us, and a massive effort was soon underway. Removing backfill from Trench PF 6 was the necessary first step in resuming excavations therein, for at the end of last year the excavated soil was filled back into the trench over a layer of green mesh marking the last excavated level, both to protect the unexcavated soil and to preserve the exposed features from the elements until the time when excavation would resume. This soil needed to be removed again before excavation of the trench could resume this year, a task easily achieved with picks and shovels by the end of the week, thanks in no small part to the hard work of all those mentioned above. The mesh was not lifted after the removal of all this soil however, but rather left in-situ over the weekend to protect the final excavated level of the trench from the elements. Next week excavation will resume in the trench after cleaning up this level, commencing work in the tile fall for the first time in almost a year. Crew at work in Trench PF 6, originally opened in 2001. Overall, I am quite pleased with the work which has been completed over this shortened week and look forward immensely to the excavation of both trenches over the course of these final few weeks in the Podere Funghi. Much knowledge has already been gained from the exposure of Loci 3 and 4 in Trench PF 9 at its current Stratum 2A level, and with the prospect of exploring the lower levels of the tile fall in Trench PF 6 so close at hand, these next few weeks certainly promise to be a memorable experience for all those involved. Base Belanger and The Return of the Banana Pants. This fifth week of excavation in the Podere Funghi has brought with it a number of minor changes stemming from the torrential downpours which slammed the Mugello Valley, but nevertheless a number of interesting and important discoveries were revealed by the close of excavation for the week. 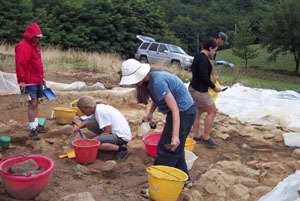 Rebecca Lanthorne, and Base Belanger excavating PF 6 after heavy rain. With the removal of backfill from Trench PF 6 finally completed, work commenced with the excavation of the tile fall in the trench's southern two loci, Loci 3 and 4, moving northward from the southern border of the trench at a depth of 7 centimeters. This pass was quickly adjusted to a depth of 15 centimeters when it was discovered that the tile fall was sloping downhill to the north at approximately that depth, and a number of interesting diagnostic tile pieces were removed and saved on-site for analysis at a later date. These pieces will play an integral role in understanding the interlocking terracotta roofing system of the structure, and by saving diagnostic corner pieces, the minimum number of tiles on site can be determined, as well as the number needed for the entire roof on the whole. 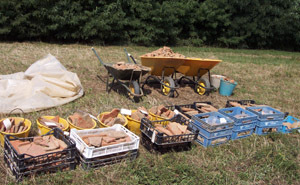 The majority of the work in the trench was dedicated to the removal of these pieces this week, and by week's end an area of approximately 2.5 x 5 meters of tile had been covered by the tile sections. Dr. Patricia Lulof, a tile and roofing system specialist from the University of Amsterdam, hopefully will analyze these sections upon her visit to the site next week. Roof tile from this season's excavation of Trenches PF 6 and 9. 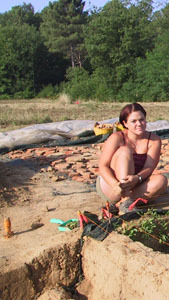 Beneath one of the largest tiles being excavated in Locus 3, Jen discovered three small black glaze sherds with red painted designs imbedded in a pocket of particularly moist soil not far from the eastern foundation wall. 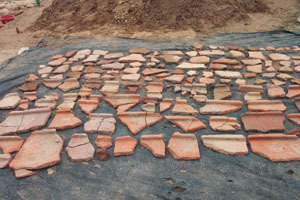 These sherds are particularly important as a datable artifact for the site, for the rouletting patterns painted on the sherds have been identified by Dr. Ann Steiner as a specific decorative element used on a particular type of skyphos produced in Volterra roughly between 325 - 275 B.C. 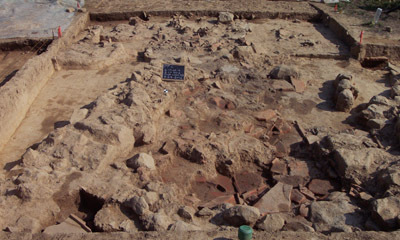 This assessment is contiguous with the generalized typology of the late 4th and early 3rd century roof tiles, and when combined with the vernacular rubble-packed construction of the foundation walls, it is fairly conclusive that the current level of the structure being excavated is Hellenistic in date. This particular discovery highlights the benefits of having both a first-rate conservator and black glaze specialist on site, and I would like to thank both Karen Stamm and Dr. Ann Steiner for their excellent and expedient treatment of these black glaze sherds. Ivo van der Graaff and Base Belanger working in Trench PF 6. Regrettably, the tile fall was exposed to the punishing rains of the Mugello Valley early this week after we were sent up to the site to uncover the trenches and work through it, and as such it is completely saturated with water. In order to give this section of the trench a chance to dry out, everyone began working on definition of the foundation walls in the trench and the removal of the dry soil to the west of the western foundation wall, a necessary task which will now allow us to give our undivided attention to the excavation of the tile fall for the remainder of the season. Although the rains have caused a change in the excavation schedule, overall it has been a successful week due to the hard work of my excavation crew, and I thank them for machoing out the tough conditions and getting a great deal of work accomplished in the process. Rebecca Lanthorne at the edge of PF 6. The crew of Trenches PF 6 and 9 excavating the tile fall. 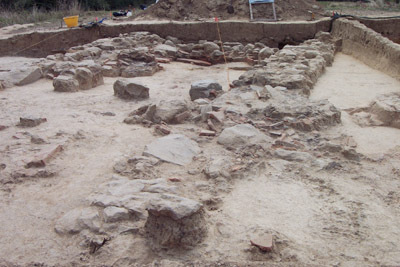 Kilns in Trench PF 9. Jenny Muslin, Robert Belanger, Rebecca Lanthorne, and Ivo van der Graaff. This sixth week of excavation has brought with it a number of interesting developments in the interpretation of the trench and the structure on the northern hillcrest of the Podere Funghi as a whole. These developments were due primarily to the hard work of my excavation crew and were spurred along by the return of milder, drier climates to the Mugello Valley now that last week's storm front has finally blown clear of Italy. Completed level in Trenches PF 6 and 9 during Week 6. Despite the return of drier weather, it was necessary nevertheless to remain clear of the tile fall area for an additional day in order to give it a chance to fully dry out. 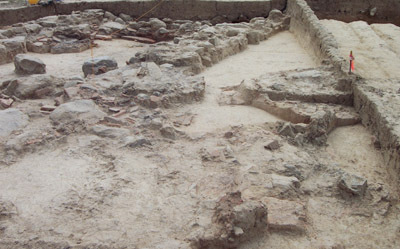 As such, cleanup of the western and eastern foundation walls resumed in Trench PF 6, while work began in the dry southernmost extremity of the trench to determine whether the tile fall extended further to the south. 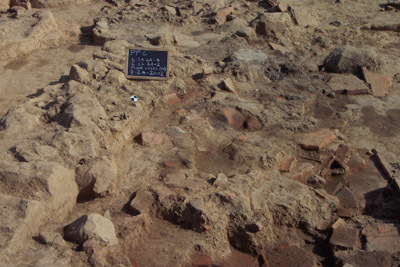 During the course of the latter, it was discovered that a crosswall of loosely packed stones and tiles existed between the two foundation walls, built in the same Hellenistic rubble-packed fashion as the main western and eastern foundation walls running northeasterly through both Trenches PF 6 and 9. This crosswall is situated at roughly the same elevation, and may demarcate an interior wall dividing the Etruscan structure into two chambers. 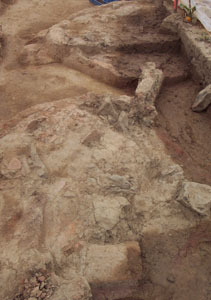 However, this cannot be substantiated without further excavation of the structure to the south, and it is also just as possible that this crosswall was an architectural element incorporated into the design as a structural element to bolster support for the main weight-bearing western and eastern foundation walls. 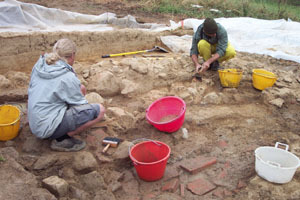 Even so, both Jen and Rebecca have been concentrating on the definition of this wall and the areas of the tile fall around it, so hopefully a clearer picture of the crosswall will become available by the close of the excavation year next week. 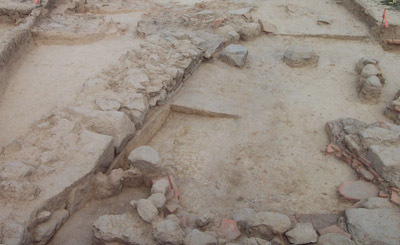 Closer view of tile and foundation wall in Trench PF 6 during Week 6 of excavation. The highlight of the week was a visit from Dr. Patricia Lulof, a tile and roofing system specialist from the University of Amsterdam, a visit which coincided perfectly with the renewed excavation of the tile fall for the first time in several days. 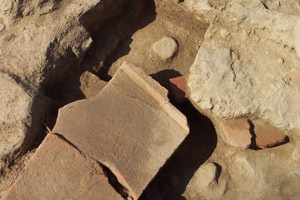 Prior to her visit, Ivo and Joe had isolated and defined several unique tile sections with diagnostic edges in addition to those previously saved for analysis on the green mesh from earlier weeks, providing both an in-situ and excavated context for her to analyze. Dr. Lulof was able to identify the roof tiles as a type roughly datable to the late 4th to early 3rd century B.C., an assessment contiguous with the dating of the black glaze sherds found in the same tile fall by Dr. Steiner last week. When this information is combined with a generalized pottery typology of the site and a look into the building style of the foundation walls, all evidence points rather conclusively to the structure as being Hellenistic in date. Again, the value of having visiting scholars on-site during the excavation year cannot be underestimated, and as such I would like to thank Dr. Lulof for her valuable insights and interpretations on the structure. Above and below: details of the roof tile in Trench PF 6.
take levels in PF 6. Rebecca Cooper reclines to work in the corner of PF 10.
and Ivo van der Graaff triangulate points in Trench PF 9. Robert Belanger draws Trenches PF 6 and 9 for his field book. 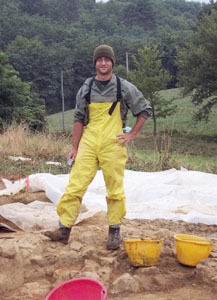 Now that the 2002 season has finally completed its seventh and last week, a few posthumous notes on the season are in order, to better widen the scope of the site as a whole, as well as the impact that the excavation of Trenches PF 6 and 9 has had on its interpretation. But before this, I must mention my undying thanks to my fantastic crew throughout the season--Meg Common, Joe Cosentino, Ivo Van Der Graaff, Rebecca Lanthorne, and Jennifer Muslin--without whose hard work this season would not have been nearly as successful as it was. Ivo van der Graaff and Robert Belanger finishing excavation in Trenches PF 6 and 9. Form of Structure: Rubble-packed foundation walls dug into natural sandstone bedrock; wattle and daub walls supported by wooden timbers; interlocking terracotta roofing system with wooden roof frame supports; two interior chambers with packed-earth clay floor built atop tile and rubble floor packing; open north face. Two possible structures, two building phases. At least 5 exterior kilns, possibly 1 more. structural usage for ceramics production. Possible domestic usage will require further excavation to verify. meter interior area. Distance between "post-pad" stones on western and eastern foundation walls is 7 meters, distance of crosswall to exterior edges of western and eastern foundation walls is 4 meters. Dimensions require 128 pan tiles, 150 cover tiles, and 15 ridge pole tiles to cover the structure's roof at a roof pitch of 10 degrees. walls follows Hellenistic regional patterns. 2. Ceramic - Volterran black glaze skyphos sherds discovered amid floor packing dated by specialist Dr. Ann Steiner of Franklin & Marshall College to between ca. 325 - 275 B.C., solidly within Hellenistic time period. View of Trenches PF 6 (foreground) and 9 from the south at the end of the 2002 season. View from the south of Trench PF 6 at the end of the 2002 field season. Above and below: views of Trenches 6 and 9 (foreground) from the north at end of the 2002 season. Ivo van der Graaff and Jenny Muslin make final drawings of the scarp in PF 9. Robert Belanger, Ivo van der Graaff, and Jess Galloway draw trench plans and elevations. make final drawings of the scarp and ground plans of Trenches PF 6 and 9. Roof tile from PF 6 loaded for delivery to the conservation lab.